New York, London, June 20, 2016 – S R Labs, LLC, a global leader in trading and market data technology, today announced it will operate under the new name of Vela, bringing the best of its technology, products and talent under one roof. Vela’s mission will continue to focus on creating and providing leading edge financial technology, with a strong emphasis on satisfying client requirements and global delivery. With Vela, technology and business decision makers will be able to bring efficiency and simplicity to their trading infrastructure, while also improving cost savings. Jennifer Nayar, CEO of Vela, said: “We see Vela as a new and exciting opportunity to build on our strong heritage, pedigree and loyal client base and bring the best of both SR Labs and Wombat into one place.” She added, ”with Vela, we want to simplify everything around us: through our technology, we want to simplify how firms interact with the markets, and increase efficiency; and with the creation of a new, integrated business entity, we want to make it easier for clients and prospects to buy from us, to work with us and to partner with us. Global Connectivity: Trading has become increasingly global and multi-asset and Vela’s dedicated global team of experts sits uniquely at the intersection of technology and the financial markets, helping clients stay two steps ahead. Clients who depend on our technology include banks, hedge funds, proprietary trading firms and a range of other market participants globally. Technology Deliverability: Vela offers a full suite of custom, scalable financial technology products and services focused on enterprise use of market data feeds and market access. Vela’s industrial strength technology along with value-added services include tools and support services that save time, money and complexity. Talent Expertise: A global, world-class client services team supports Vela’s comprehensive product suite to ensure implementation surpasses expectations. Many of Vela’s offerings are also available as fully managed services. 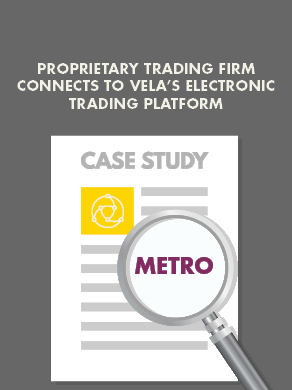 Providing the technology to underpin trading infrastructure, Vela enables clients to focus on core business and competencies.